Gordon Murray, who’s designed everything from the iconic McLaren F1 to actual Formula One cars and even a bunch of city cars, launched a company of his own a while back and announced a car in the works—one more focused on driving than on power numbers. The numbers are finally in, and they look good. Murray has maintained for some time that the future of performance is making cars lighter, not necessarily more powerful, and his T.43 definitely lives up to that ethos. He’s on the same track as he was when he announced it last year, with performance above power figures on his priority list. 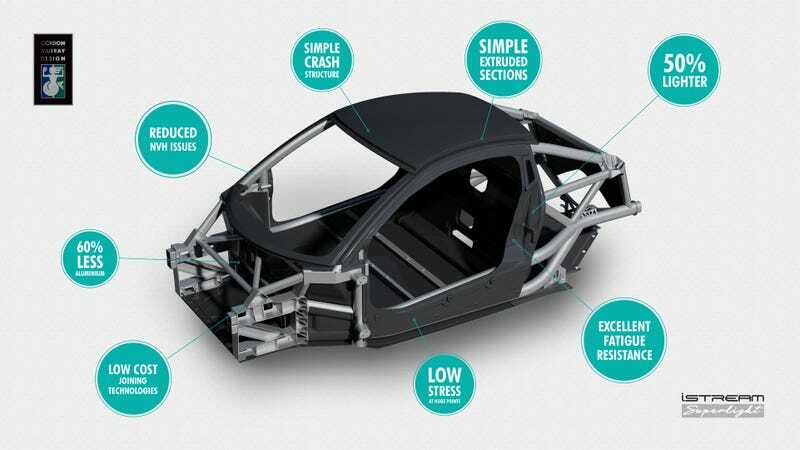 Gordon Murray Design posted a press release Tuesday claiming its new “iStream” chassis and seat designs could cut the weight of a car in half, and said that weight-saving technology will be in Murray’s new car. The teaser image Gordon Murray Design posted in November of 2017. The T.43 will only weigh about three fourths of what a Miata does at just 1,874 pounds, and it’ll have 40 more horsepower. That makes for a rated 220 HP from the car’s three-cylinder turbocharged engine, and the only transmission option the release listed was a six-speed manual. That’s how it’s done. The announcement also said the iStream chassis can be applied to all kinds of different cars: SUVs, sports cars, city cars and light commercial vehicles. If the stuff works smoothly there, it’s a big deal. The lighter the vehicle, the more efficient it is, and the better power-to-weight ratio it has—like the T.43. As for the T.43, Murray launched his car company, Gordon Murray Automotive, in October 2017 and announced the car right around then. He said it would be “inspired by the engineering” of the McLaren F1 without the power to match, because that wasn’t what he was going for. He was going for more practical fun. [Murray] stresses it’s meant “for real-world conditions”. That means not too much power? He nods. We talk about the McLaren 720S, which I’ve just been driving, or the Ducati Panigale motorbike he had been considering but rejected – things that are too fast for the road. “You can never even use maximum revs on those 200 horsepower bikes. You’d be dead or in prison.” he sighs. With the crossover takeover and the general bleakness of the automotive industry, at least for the people who aren’t mega rich, “I just want to get back to real driving” is so poetic. If only I had the space to tattoo it on my knuckles.